In the immediate aftermath of Ian Curtis’s untimely death, for Joy Division to not just carry on but fundamentally reinvent themselves under a new banner and ultimately alter the face of British alternative pop, seemed, in that cruel summer of 1980, a mission impossible. The term “regroup” doesn’t cover it. As New Order (the name itself a manifesto), they shuffled Bernard Sumner to the front, added Gillian Gilbert at the back, recorded two existing Joy Division songs in the new formation, Ceremony and In A Lonely Place, and produced an LP that looked and sounded and felt like Joy Division minus Curtis and plus extra synth. As relieved as the discerning were to have them back in business, and so soon, Movement was robbed of sunlight by the Joy Division memorial Still, and it all felt a bit like a holding pattern. Then they went to New York, and the next ten years were about bringing it all back home. Between the rule-rewriting Temptation in 1982 and the final long-player before the band’s first split, Republic, in 1993, New Order really did bestride the twin worlds of pop and dance like four blushing Colossi. They even outlived Factory. 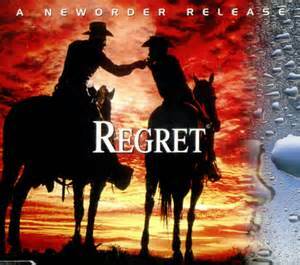 Regret, the majestic lead-off single and a hit all over the shop, was number one in Billboard’s Hot Dance Club Play charts and Modern Rock Tracks, which just about says all that you need to know about New Order. Is it dance? Is it rock? Does it – to deploy the cliché – sound better in a club? Or in a barn? Or in a field? The answer is that it sounds better anywhere and everywhere. (I listened to it a lot, alone, in a one-room studio flat in Streatham in South London and it worked for me.) If New Order started out as three young men and one young woman with “weight on their shoulders”, they ended their first ten-year stretch on top of the world, looking down – you might say – on Creation. The whole of Republic is a showpiece. But Regret is pure cinema. I saw New Order on a boiling hot afternoon at Reading that year and entered a higher state of consciousness when I heard the riff to Regret, one I am physically unable to resist miming. I cannot play the guitar. This is important. But who were these bands? 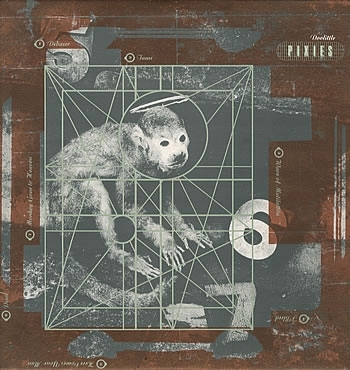 As 4AD completists it was inevitable that either Rob or I would purchase Come On Pilgrim, the Pixies’ debut mini-LP, without having heard a note. Indeed, Rob has pricked my memory: we visited the degree show at the Royal College of Art of photographer Simon Larbelestier in the summer of ’87 and the hairy-backed Victorian freak-show gentleman adopted for Pilgrim’s sleeve was displayed therein. Making this link to the RCA – where Rob was about to start his own MA – he invested in the album in suitably Pavlovian manner. My clear memory of first hearing the subsequent Surfer Rosa is in a large, roomy artist’s pad in Notting Hill, where Rob was house-sitting for one of his tutors in Easter ’88. Salad days. The second time we saw the Pixies in London, they were promoting Doolittle. Rob remembers the band members coming round “all hunched with cigarettes pinched between finger and thumb” down the side of the venue while we were in the queue. With our feet in the air and our heads in the ground, we worshipped the Buddha-like Black Francis and felt the potent pop thrill of singalong songs like Where Is My Mind?, Gigantic, Monkey Gone To Heaven, Wave Of Mutilation and Debaser. Frank Black tears into this recording with its highbrow nonsense lyric as if these were his last two minutes and 52 seconds on earth, a sentiment in line with the apocalyptic fatalism that pervades much of Doolittle (“got killed by ten million pounds of sludge from New York and New Jersey … Now there’s a hole in the sky … Everything is gonna burn … Drive my car into the ocean … A big, big stone fall and break my crown”). Black’s hymn to debasement is short on detail (“Wanna grow up to be a duh-base-ah”), but long on beret-wearing film-school cool, making an explicit reference in those sliced-up eyeballs and the “chien Andalusia” to the silent 1929 Luis Bunuel/Salvador Dali short Un Chien Andalou. Neither film nor song has a plot to speak of. The BFI’s Museum Of The Moving Image opened on London’s South Bank in 1988; ill-fated, it would turn out, but fun to visit in those happy first years for its primitive interactivity, movie heirlooms and well-stocked bookshop. I feel sure I did so within its first year, and that’s when I saw Un Chien Andalou for the first time, transfixed by its darkly playful cut-up imagery in the little dedicated viewing booth for 21 minutes. I felt like staying for the next showing (it was on a loop), mentally prepared this time for the unannounced eyeball-slicing money sequence, in which the film cuts from Simone Mareuil’s eye about to be passed over by a straight razor to a cloud slicing into a full moon and then to a dead calf’s eye being bisected. It is one of the least forgettable moments in the history of the moving image. Who wouldn’t write a song about it? Debaser doesn’t quite cleave to the quiet-LOUD, bam-THWOK mechanic of the stereotypical Pixies song, as after that neat, buttoned-up bass intro, it leaps into life, with a tambourine hurrying along the first verse, Black announcing to the world that he’s got him a movie. The chorus invites the rest of the band along to shout, “Chien!” and it’s a frantic evocation of Iberian canine declaration. Cobwebs are blown. Ears are syringed. Black’s vocal cords are ravaged for your listening pleasure. Kim Deal offers a characteristically dry spoken endorsement of the title (and she was so … quiet about it). And it sounds for all the world that he’s already grown up to be a duh-base-ah. British producer Gil Norton does a bang-up job on Doolittle, taking the graphic sound of Surfer Rosa and giving it a fuel injection. He would remain an ally. The LP was their first hit. Monkey Gone To Heaven – a close contender for this entry – gained college radio traction in the States and consolidated the band there. But – unlike Samson in Gouge Away – success did not sap their strength. The animosity that precipitated their break-up and made frankly mercenary their cold-war reformation was nowhere to be seen in the late 80s and early 90s when they surfed that wave of adulation. I declined to see them play when they reformed, as I’d seen them the first time, when the band might still amble past you in the queue. Thanks, Massachusetts. Thanks, Mr Dali and Mr Bunuel. Thanks, Rob. Through this route did I come upon Entertainment!, whose most-likely-to single, At Home He’s A Tourist, had crossed my radar via its lyrics in Smash Hits the year previously, but which – as is now legend – had been denied its Top Of The Pops shot because the band refused to amend the lyric about “the rubbers you find” and had thus failed to breach the Top 40. Never mind. 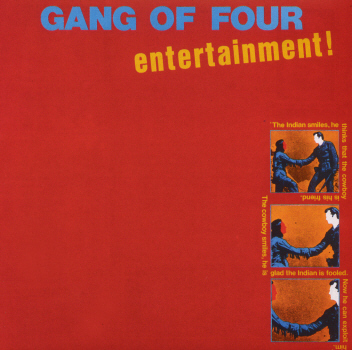 Gang Of Four were a band designed to exist outside of the mainstream. I might not have fully understood their Situationist influences or Marxist politics at 15, but I sure liked the idea of what they were saying about consumerism and war and whatever linked guns to butter. Entertainment! turned out to be my favourite album of all time. I loved it in 1980 when I taped it and played the cassette until the magnetic coating was worn off. I loved it again in the mid-80s when, as a student, I finally purchased the LP I’d previously been loaned by the public sector. And I loved it all over again on CD soon after. It literally never fails to excite me. I never saw Gang Of Four the first time around (and have never seen them in revived form), so the music’s hold on me is purely aural. And intellectual and political, obviously. And I think the reason that 5.45 always rises to the top is that it rose to the top 39 years ago. And lodged there. It may not have the urgency of Damaged Goods, nor the squalling audacity of Anthrax, nor the sensual throb of Tourist, but 5.45 has a simplicity and directness that’s almost a capella. And it has a melodica; perhaps the most effective and beautiful use of that remedial wind instrument in all of post-punk. Of course it begins – as so many of my favourite songs do – with a bare drum beat, typically unshowy and literal from Hugo Burnham, and easy for an aspiring teenage drummer to copy with two rulers on a stool, as I diligently did. Then that polite, wheezy melodica from King. And when Dave Allen’s bass grumbles in, the shooting match begins. Repetition is a weapon in the Gang Of Four’s best work – honestly, it’s like The Teletubbies, except with Sandinistas – and so it proves with the mantra, “Watch new blood on the 18-inch screen, the corpse is a new personality.” King and Gill sound like they cannot stop singing this until a ceasefire is called, at which we can all get back to the fried egg we have for our “tea”. And it’s called 5.45 – “quarter to six” – could it be any clearer if it was titled After Noah & Nelly? I wrote recently about how literate pop music was in the 70s and 80s. Gang Of Four may have not quite made it into the charts, but their debut LP did much to rouse me from my apolitical slumber, aged 14 going on 15. Let’s not post-rationalise; it did not “politicise” me on the spot (I wouldn’t become a Neo-Marxist until I’d left school), but from Entertainment!‘s attention-demanding sleeve, with its “red” Indian and its “white” cowboy shaking hands (“He is glad the Indian is fooled – now he can exploit him”), to the unequivocal chants of “H-Block torture!”, it provided a running buffet of food for thought. There are some songs in The 143 that may only have entered my personal pantheon in the last few years; instant classics, you might call them. There are others which were instant classics when I first heard them – in this case over 30 years ago – but which have never left me in the interim. Those songs that you turn to frequently, and regularly, for sustenance. Not necessarily the most famous songs in the canon, but the ones that literally never fail to do it for you. As The 143 grows, a number of these will crop up: Little Fluffy Clouds, She’s Lost Control, Heart Of Glass, Le Freak. And this. Because of the vintage, this might be one of those singles that I bought sight unseen – or rather, sound unheard – having liked the name of the band and read a rave review of it in the NME or Smash Hits and then taken a flyer. Or, I could have heard it on John Peel. I have a feeling it’s the former. I started meaningfully collecting seven-inch singles in 1979, suffused with a 14-year-old’s urgency to buy into punk just as it was burning out, and, I admit, dazzled by the “picture sleeves” they almost always came in. (I’ve mentioned my later love of 4AD sleeves; this magpie attraction started with punk single, whose stylish arcana I pored over.) The magazines would illustrate their singles review columns with postage-stamp reproductions of the sleeves of the day, and these were the pocket-money-clutching consumer’s flags. The sleeve of 4 Hours – an indie single recorded by an unknown-to-me Sheffield industrial-experimental funk-punk outfit comprising Adi Newton and the late Judd Turner whose name couldn’t have been more starkly post-punk if it had tried – was murky and obtuse, but its horror-movie imagery drew you in. Who was that lurking figure, and who were the couple horizontal? The equally murky and obtuse record within revealed the source: “I see two people, asleep,” groans Newton, delivering a protracted fever dream of vivid, cinematic vignettes which to this day never fail to do it for me. Over a grumbling bass, a blunt-instrument drumbeat and the pained wail of a sax, we are indoctrinated into a neo-noir nightmare of taxi cabs, falling pianos, distant clarinet, stained sheets, indistinct cities (“this could be New York, this could be London, I don’t care any more”), the pressures of some kind of Orwellian statism (“I could go to work, I know where it is … they will not have to force me, I will go there willingly”), black tie, black suit, black case, and what sounds like a “suction entanglement” but may be “such an entanglement”. The groan is augmented by a muttered version of the same lyric, lagging behind, adding to the unease. Hey, this is uneasy listening. I was so taken with the four-minute 4 Hours, I never thought to check out the album, Thirst, and only heard it years later; it was disappointingly not much like 4 Hours, more squonky, more experimental, less linear. 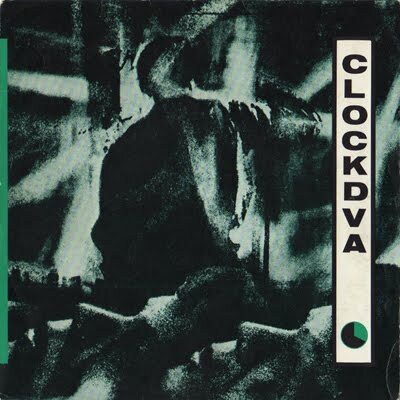 I’ve read that Newton has reconvened Clock DVA many times since they first split in 1981, and you sense that he is driven, creative man, kept going by the more arty pockets of Europe, and long may that be the case. In this one uniquely intoxicating slab of Gothic “pop concrète“, he has sealed his place in the Valhalla of post-punk immortality. Let us join them in their dreams. We’re only four moments.